WTI crude prices have just recovered the $48/b mark this morning. WTI opened at $47.67/b today, a drop of $0.48, or 1.0%, below yesterday’s opening price. 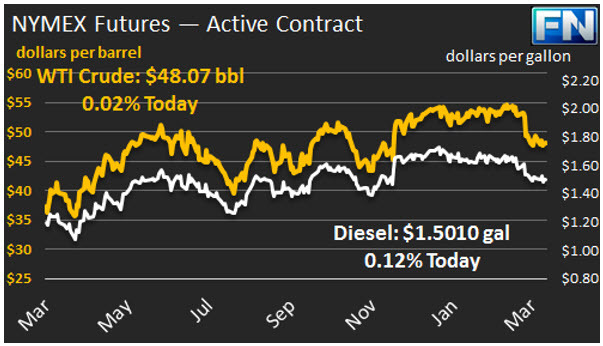 Current prices are $48.07/b, a recovery of $0.37 above yesterday’s close. 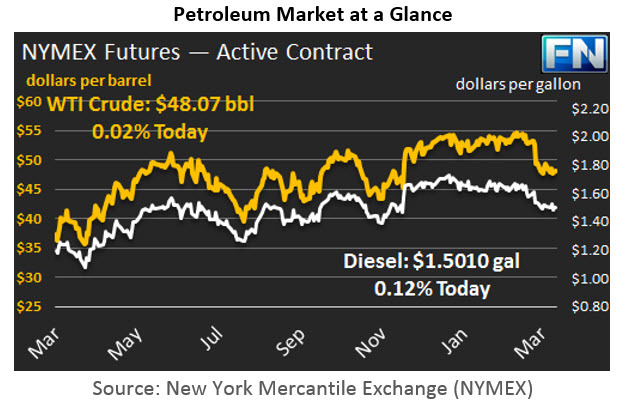 Both crude and product prices are in the midst of an early-morning buying spate, but as of the time of this writing, there does not appear to be enough bullish news to move the market significantly higher today. Diesel opened at $1.4883/gallon in today’s session. This was a drop of 1.14 cents, or 0.76%, from yesterday’s opening price. Current prices are $1.501/gallon, up 1.09 cents from yesterday’s close. Gasoline opened at $1.5878/gallon today, a drop of 1.41 cents, or 0.88%, from yesterday’s opening. Prices are $1.6005/gallon currently, an increase of 1.09 cents from yesterday’s close. This week’s EIA report on stocks showed another increase in crude inventories, a build of 4.954 mmbbls, which brought the total to 533.1 mmbbls. Gasoline stocks were drawn down by 2.811 mmbbls, and diesel inventories were drawn down by 1.91 mmbbls. The issue of burgeoning stockpiles kept prices down again this week. Early spring refinery maintenance typically brings an increase in crude inventories and a drawdown in product inventories, but the additions to crude stockpiles have been relentless this year. The EIA also reported a continued rise in U.S. crude production, plus a significant drop in apparent weekly demand for gasoline, jet fuel, and diesel. The OPEC monitoring committee will meet in Kuwait this weekend to analyze compliance and the effectiveness of the cuts so far. OPEC has reported very high levels of compliance. This has been corroborated by independent analysts and international agencies. The International Energy Agency (IEA,) for example, calculated OPEC compliance at 91% last month, plus 44% compliance from the Non-OPEC participants. Global inventory levels have not yet fallen as expected, however, and OPEC is likely to extend the cuts beyond the June 2017 end date. The House of Representatives yesterday delayed a vote on the Trump proposal to repeal and replace Obamacare. The Trump Administration has stated that this healthcare legislation is essential, and that plans for corporate tax reform and infrastructure expansion cannot move forward without its approval. Another attempt at a vote is scheduled for later today, but Republicans are unsure if the bill has enough votes to pass. This is causing market uncertainty, since the tax reforms and infrastructure expansion are viewed by many as the key pro-growth items in the Administration’s platform. UPDATED 04/23/19 - 11:06 a.m.